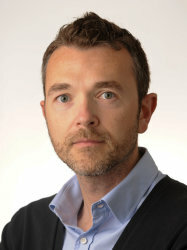 Riccardo Secoli received the MSEE in Computer Engineering (branch Control System Engineering) from the University of Padua (Italy) in 2006. He then joined the Department of Innovation in Mechanics and Management (University of Padua), where he gained a PhD in Industrial Engineer with specialization in Mechatronics and Industrial System in 2010. In 2009, he was a visiting PhD Student in the Biorobotics Lab (Dept. Mechanical and Aerospace Eng. - University of California Irvine - USA) where he joined as post-doc until 2011. Main Research Topics: bio-inspired minimally invasive surgical systems, assistive devices for rehabilitation of patient affected by stroke or for cerebral palsy children. Frugal innovation. Coordinator for the robotic theme of the European Project: EDEN2020 project.